Dmae Roberts talks with author Dale E. Basye about his book series for young readers, Heck. The fourth book in the series, Fibble, was released last month. Basye also sings songs that he wrote for the series and reads passages from the books. 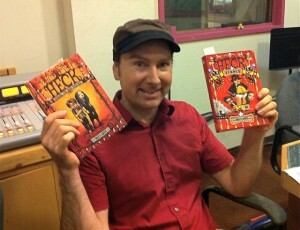 Hear the entire “Heck” of a fun interview and singing by Dale E. Basye! 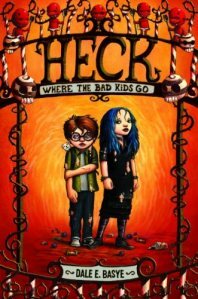 The first book Heck: Where the Bad Kids Go book follows Milton and Marlo Fauster, a brother and sister who get sent to Heck after a fatal marshmallow bear explosion. The books follow them as they make their way through the otherwordly reform school that is Heck. In Fibble: The Fourth Circle of Heck, Milton and Marlo find that they’ve switched places. It’s currently available at Random House. His book Snivel: The Fifth Circle of Heck comes out in May. Basye got the idea for writing the Heck series when a friend of his was working on a mockumentary about the devil, and Basye decided he wanted to write about hell for children. As a kid, Basye hated school. But he found a deep love for writing, and was encouraged by teachers who helped him foster his imagination. I would just like to know what is the fourth book of the series of Heck!! 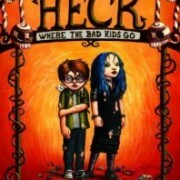 I would like to know what the first book of the series of heck is!!! The first book is called “Limbo” and the fourth books is called “Fibble”–hope this helps! Please check this out if interested, let us know. Thank you. We are now accepting applications from Authors, Publishers, Bookstores, Schools, Libraries and Book organizations. It’s not too early to start planning ahead towards practical ways to sell and promote our books this year. By signing up earlier you’ll have a better chance to reserve your space, principally if you are a bookstore, library or publisher and need a larger space or corner booth. Technology is taking giant steps transforming our old world as we knew it, into a new and exciting trend for authors, publishers and anyone connected with the literary world.. Let’s start taking advantage of the amazing times we live in by being pro-active and maintaining the enthusiasm our work deserves. No more hiding our books inside a book store. Let’s be seen and let it be known where we will be next, by promoting the world of the written word. The 4th Annual NW Book Festival will be once again at the historical Pioneer Courthouse Square in downtown Portland, which is considered to be one of the busiest most visited sites by city dwellers as well as tourists from all over the country. Keeping books alive is my priority for organizing the 4th Annual NW Book Festival, 2012. *** Feel free to pass this information to your fellow authors and friends. Meet critically acclaimed and well known authors in person, get an autograph, ask questions, and get inspired! Let’s keep books alive! A fun filled family day, and it’s free! There will be books on, Poetry, Romance, Spiritual/ Self-Help, Children books, History, Memoirs, Horror/Thriller, Humor/Satire, Travel, Young Adult, Fantasy, Shakespeare, Art, and so much more.